For every cryptocurrency that exists, there are hundreds of thousands of enthusiasts that back them up. Some people do it purely for financial means, others believe in the crypto’s future and want to support the cause. Whatever the reasoning behind it might be, it is clear that everyone has a favorite. That’s why today I would like to tell you how to buy Ripple – one of the most popular and successful cryptocurrencies in the world. To start things off, I’ll tell you a bit about Ripple itself. I’m sure you might already know quite a bit about this cryptocurrency (you probably wouldn’t be reading this guide if you didn’t), but a nice refresher will be good for a fluid start. After that, we’ll talk about why and how to buy Ripple, where to do it and so on. So, let’s not waste any time and jump straight into it! 2.4 What’s the Deal With Coinbase? Let us discuss why Ripple is as popular and loved as it currently is (it holds the 3rd spot in the cryptocurrency market and is the center of attention in many different cryptocurrency circles). There are many different reasons and factors that ultimately come into play, but I’ll be naming just the main ones. Now, before we actually begin talking about Ripple, it is important to distinguish one simple thing – the cryptocurrency that we call “Ripple” isn’t actually called “Ripple”. It’s confusing, I know, but just bear with me. Ripple is actually the name of the system that holds the crypto-coin in question. The coin itself is called XRP. However, it’s evident that people got so used to calling the coin Ripple, that nobody even cares anymore and everyone understands what they’re talking about. So, for the sake of simplicity and clearance, in this tutorial, I will be referring to the coin as Ripple, too (unless stated otherwise). Now that we’ve got that out of the way… What is Ripple? In it’s most simple form, Ripple is a centralized cryptocurrency that was released back in 2012 by Chris Larsen and Jed McCaleb. Notice the key word in that sentence – centralized. Ripple is one of the rare centralized cryptocurrencies that have actually made it big. The term centralized means that Ripple belongs to a company – most cryptocurrencies today are decentralized, which in turn allows anyone and everyone wanting to contribute to their development pitch in. Decentralized cryptos became the industry standard – they are seen as the future of cryptocurrencies (being the literal embodiment of the word free). However, quite obviously, Ripple made it… How? For the longest time, Ripple was called “the Bitcoin killer”. That’s a pretty bold statement, but the coin had means to back it up. First of all, because of the fact that Ripple is centralized, it thrives in its own designed and tailored ecosystem. This allows for the transactions that are made with the coin to be extremely fast, especially when compared to the speeds that Bitcoin provides. Another huge reason for Ripple’s success is the coin’s position bank-vise. Ripple is partnered with more than a 100 banks worldwide, allowing the coin to be accepted into the mainstream. If you have any knowledge on the topic of cryptocurrencies, you understand just how big of a deal this actually is. Currently, there are governments in the world that outright ban cryptocurrencies from their countries. Ripple is the only crypto coin that has a green light – because it is centralized and regulated, institutions such as banks are more lenient and trustful towards it. As of the time of writing this tutorial, Ripple is currently valued at $0,44 USD. 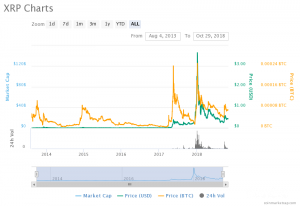 The company behind the coin claims to have developed a system to help Ripple’s price gradually increase. The system is actually pretty simple: upon Ripple’s release, 1 billion coins were issued to the public. The protocol was designed so that no more coins could be created – this means that when you use XRP in a transaction, the amount that you used is gone forever. 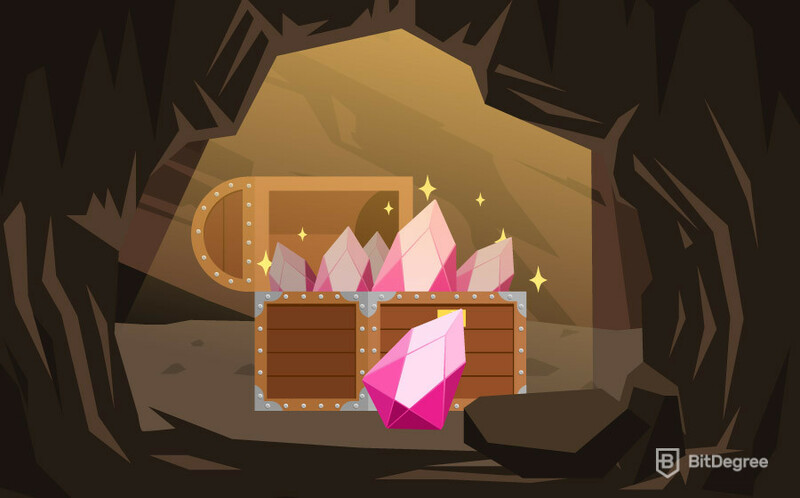 The principle of scarcity is applied in this scenario – the less Ripple coins there are, the more valuable they become, just like gold or diamonds. With the crypto market being so volatile, it’s tough to say if this principle actually works or not. However, the fact that Ripple is still in the 3rd spot in the market position and that people are still looking for how to buy Ripple should probably be a good indicator. So… How to buy Ripple cryptocurrency? Buying Ripple might prove to be a more challenging task than, let’s say, buying Bitcoin. And that’s not only because Bitcoin is so popular. Because Ripple is centralized, not all of the popular cryptocurrency exchange sites list the coin as an available option. A lot of people that are looking where to buy Ripple might hit a wall pretty fast when they see that their favorite crypto trading platforms don’t host the coin. This is the case, for example, with people that are looking to buy Ripple on Coinbase – it’s simply not possible (not with the traditional methods at least). People are also looking how to buy Ripple in USA – there are a few sites that offer good exchange rates and transaction fees for US-based citizens. I’ve comprised a list of some of the most popular methods and platforms to buy Ripple from. This list isn’t arranged in any particular order unless stated otherwise. If you’re thinking how to buy Ripple, BitStamp (by public opinion) is considered one of the most popular and easy ways to do it. Even on Ripple’s official website (ripple.com), BitStamp is on the top of the list in the “XRP Buying Guide” section. So, how to buy Ripple on this platform? First of all, you’ll need an account. A name, surname, email, and country of residence are required to create a profile on the site. After that, you’ll get a unique user ID and password for your account. Remember this info – you’ll need it to login into your account! There’s one more big step that is keeping you away from buying Ripple – you will have to verify your account. This is done by providing a legitimate proof of your ID. Truth be told, a lot of people shun away from the idea of verifying their IDs when it comes to cryptocurrencies. These people simply want to go about their business in a private matter, and ID verification is the opposite of that. However, you should keep in mind that Ripple is a centralized cryptocurrency. It’s completely official and legal to buy, trade and sell it (unless stated otherwise by your country’s government or other authorities). In this scenario, such verification processes are completely normal procedures. Note: For additional security, you can also set up a 2-factor verification process on your newly created account, although it isn’t necessary. Once you’re finished with this process, you can then deposit fiat currencies into your BitStamp account and use them to buy Ripple on the platform. Thinking about how to buy Ripple in USA? BitStamp’s got you covered – the platform provides it’s services to both EU and USA customer alike. Another very popular option for how to buy Ripple in USA and EU, Kraken in one of the more respected and reputable crypto trading platforms in the market. For the longest time now, Kraken has been recognized as the most trustworthy Bitcoin trading platform in the world. Based in San Fransisco, Kraken was released to the general public all the back in 2011 – only two years after the inception of Bitcoin. Needless to say, the company has managed to garner a reputation for itself. How to buy Ripple cryptocurrency on Kraken? Well, the process is actually pretty similar to that of BitShare’s. You create an account, verify it, then go on to verify your ID and that’s it – you can start trading! You’ll also need to deposit a fiat currency on to the platform in order to buy Ripple. The most commonly used fiat currency on Kraken is, naturally, USD. 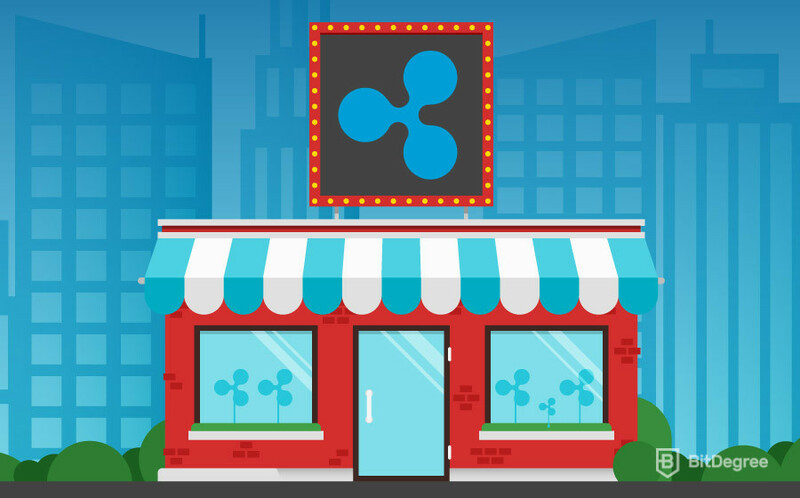 If you are specifically looking for ways how to buy Ripple in USA, then Kraken is probably one of the best places you could turn to – not only is it reputable and trustworthy, but it is also US-based. This makes the process of verifying your account and buying Ripple much faster and easier. Cex.io is yet another cryptocurrency trading platform that is widely used by people looking for how to buy Ripple online. Although not as popular as the other platforms on this list, Cex has managed to build a reputation of a good and trustworthy crypto exchange platform. The reason why you might have not heard about Cex is that it is mostly used by European and UK-based crypto enthusiasts. Cex serves as both a cryptocurrency trading platform and a crypto coin wallet – this makes the processes of buying, selling trading and swapping coins on site much easier and more fluid. The platform was launched in 2013 and is considered to be super beginner-friendly to use. Another great feature that Cex offer is that they store user’s funds in offline storage areas – this serves as a layer of extra-added security. The process of how to buy Ripple on Cex is pretty much straightforward and in-line with the other marketplaces on this list. Register, verify your account and ID and deposit fiat currencies or popular cryptos such as Bitcoin or Litecoin – and that’s it! You’re ready to trade and buy Ripple. What’s the Deal With Coinbase? A lot of people online are looking for how to buy Ripple on Coinbase. These searches don’t usually last long, however – they quickly find out that one cannot buy Ripple on Coinbase. The platform simply does not list this cryptocurrency for sale. However, there are various ways to avoid it. If you really want to get involved with Coinbase, you can buy some other crypto coin on their platform and then use it to purchase Ripple elsewhere. It might seem counterintuitive, but there’s actually merit to doing this. You see, Coinbase is often the number one stop for people who have just gotten into cryptocurrencies and want to start trading them, but don’t really know where to start. That’s why Coinbase offers only some of the mainstream cryptocurrencies out there (like Bitcoin, Ethereum and so on). In addition to that, the platform tends to have very decent trading fees – this could incentivize people to buy crypto coins on their platform and then use them to make other purchases. As you can probably see for yourself, cryptocurrencies are still causing big waves of excitement around the world. People aren’t only looking where to buy Ripple – every single popular cryptocurrency in the market gets this and similar questions thrown at them. And, truth be told – this is an ever-growing process. The natural train of thought is such a situation would be that mainly decentralized cryptocurrencies take the leading positions when it comes to public interest. After all, the whole concept of a cryptocurrency is based upon freedom and decentralization. However, then we encounter Ripple. Ripple’s successful positioning on the top of the market could mean several things. It could mean that people are still interested in it, that the creators are working on something big for the future, that the cryptocurrency is becoming more widely accepted in the decentralized-cryptocurrency-fan communities… Sure enough, though, it certainly shows that Ripple is far from being forgotten. In this tutorial, the aim wasn’t only to answer simple questions like “how to buy Ripple?” or “where to buy Ripple?”. I wanted you to see the bigger picture – to not only find out about the buying process but to also comprehend why thousands of people around the globe are looking for “how to buy Ripple cryptocurrency?”. Well, we have reached the end of the “How to Buy Ripple?” tutorial. I hope that you will use the information that you learned to find the best Ripple trading platform out there!